As was revealed by MCN last month in Phillip Island, Valentino Rossi has today confirmed he will switch to Bridgestone tyres in 2008. An official announcement has just been made by Yamaha in Valencia, confirming that the Italian will run as the lone YZR-M1 rider on Bridgestone rubber, with Rossi’s Fiat Yamaha team-mate using Michelin. Rossi admitted he first pushed to dump Michelin after his poor performance in the Laguna Seca GP at the end of July. An initial request by Yamaha in August was turned down by Bridgestone, which then prompted a huge political wrangle. Dorna boss Carmelo Ezpeleta got involved and it was his intervention and subsequent pressure on Bridgestone to supply just for Rossi that saw an agreement reached last Wednesday. Rossi will debut Bridgestone tyres in Jerez later this month, with Michelin refusing to release him from a contract to begin testing on Tuesday in Valencia. But the situation has become largely irrelevant with Rossi’s broken right hand meaning he wouldn’t have been able to test in Valencia anyway, and most likely he wouldn’t have recovered in time to test in Sepang on November 15. Yamaha’s contract with Michelin doesn’t expire until the end of the month, and discussions have been on going about an early release for Rossi to let him test in Valencia and then in a three-day session in Malaysia. 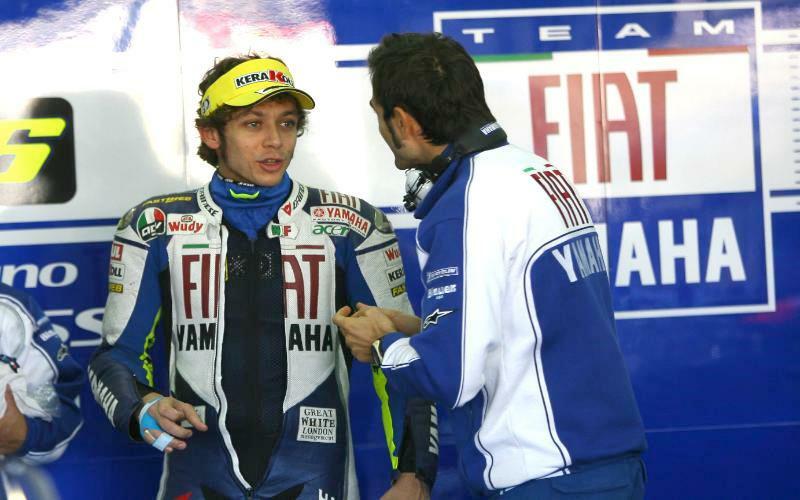 But furious at the scathing criticism from Rossi in 2007, Michelin was to block Rossi from making an immediate switch to rivals Bridgestone after tomorrow’s Valencia GP. Yamaha bosses submitted a formal request to Michelin to get Rossi released. That was turned down, meaning that Rossi would not have been able to test Bridgestone tyres for the first time until 2008 in a test in Malaysia when the seven-week testing ban ends on January 20. A compromise was to let Rossi make his Bridgestone debut in Jerez at the end of November, which is the reason why he announced on Thursday that he was unable to participate in the Rally of Great Britain. He had initially been cleared by Yamaha to drive a Subaru, but was then asked to withdraw from the rally to attend the Jerez test, which takes place at the same time. Rossi started today’s 30-lap race with three broken bones in his right hand, and he bravely rode to try and stop Dani Pedrosa from snatching second place in the championship. With Pedrosa running away at the front, Rossi only needed to finish 15th to claim second, but he retired on lap 18 after an engine problem struck at the first corner. See new product launches and 23 new motorcycles in MCN's biggest bike launch issue of the year, out Wednesday November 7, 2007.